can you believe this man is 46 years old? aaron kwok [郭富城] attended an event in hong kong on new year's day, and performed with baby smooth skin, alexis mabille sequined argyle cardigan, moncler gamme bleu shorts and very questionable tights. should there be an age limit for sequined cardigans? and when i said "very questionable tights". i don't even mind the clashing argyle and tartan prints, but would really prefer aaron to wear the long trousers version of the shorts. and his tights looked too big for him too. 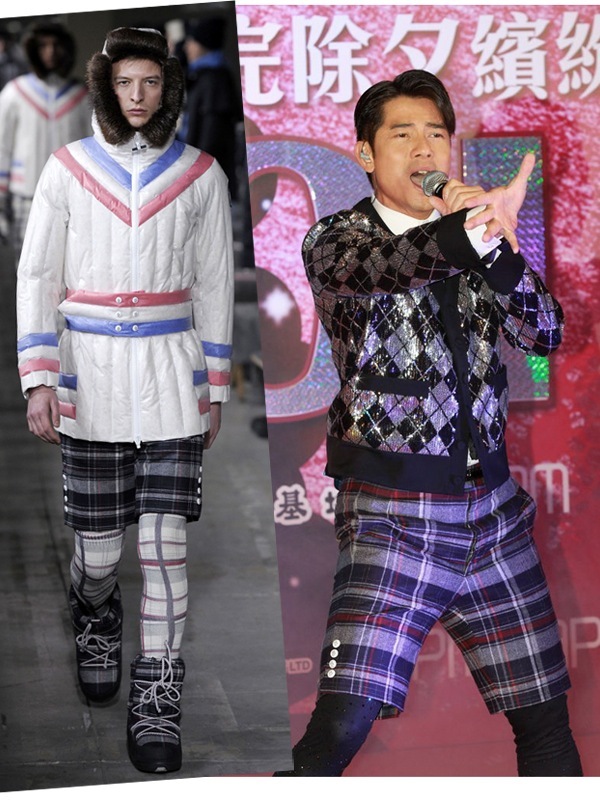 and if he must wear tights, i really prefer the moncler gamme bleu ones on the left. what do you think of aaron's look, should he be dressing his age? For a 46yr old he looks great; I would do the same if I were his age, believe me! Lol! I was only aiming on his overall look as an older guy. But your right, someone should have replaced the cardigan by one that's more toned-down. obsessed with the cardigan, as always the case for me when it comes to everything Mabille! but why the heck was that fabulously fancy cardigan paired with yet another fancy pants? seriously! the cardi obviously looks way better on the model, not that aaron kwok isn't good looking, because boy, i have been falling head over heels in love with him ever since the para para sakura days. but the styling is just off, period! Ok, I am the naysayer here but I actually quite like the overall look. Albeit I think someone slightly younger should be wearing it, but the outfit in principle is quite interesting to me as it mixes clashing patterns and textures. Additionally, let us not forget that it is a stage outfit not meant for real life. for a 46 yrs. old, he looks damn GOOD! ...............if you can pull it off like what he did then why not!